Hello Eels, if you would love to support JKS and Daebak (his new upcoming drama), you could purchase the Daebak T-shirt which designed by our in house designer from TEF. To Purchase please go to this site. Price is USD20 + shipping, there are SIX colors available with various sizes (XS-XL). 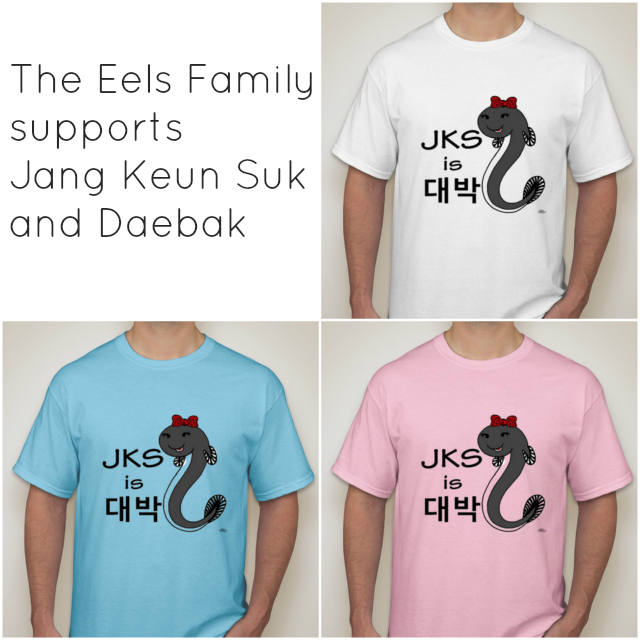 The fund raised from T-shirt sales will be paid directly to The Eels Family Treasurer for the support and promotion of Daebak drama. If this site does not ship to your address or country, please choose the option "Pick up from Kathy Philpot." After you place your order please direct message @theeelsfamily on Twitter, or send an e-mail to eels4ever@gmail.com and write "Booster delivery" in the subject line. We will contact you within 24 hours to get your shipping address and information. If this site does not ship to your address, please choose the option "Pick up from Kathy Philpot." Once your order is placed, please direct message @theeelsfamily on Twitter, or send an e-mail to eels4ever@gmail.com with subject "Booster delivery." We will contact you within 24 hours to get your shipping information. Booster.com will ship your purchase to us, and we will then ship to you. Items will ship to us approximately 12 days after the campaign ends. We will contact you when we ship your item. There is an option to "Pick up from Kathy Philpot." Please choose that option. You can then direct message @theeelsfamily on Twitter, or send an email to eels4ever@gmail.com with your name, address and phone number. Your order will ship to me, and I will then ship it to you. Thanks for your efforts in support JKS,the pink and the blue are beautiful.Esther Noloc.